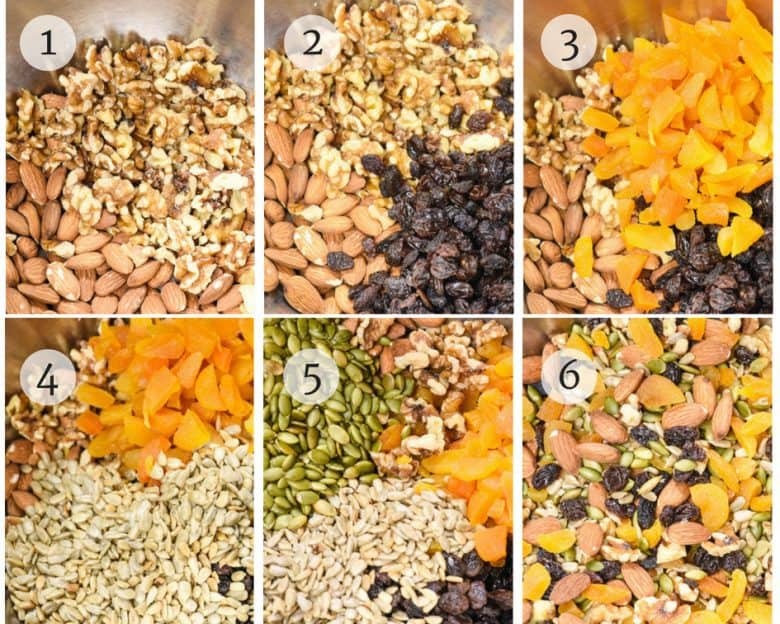 This Homemade Trail Mix Recipe is made with a delicious mix of dried fruit and nuts. It makes an easy healthy snack, perfect for the whole family. Make a big batch and store in airtight containers for a convenient and quick snack any time of the day. 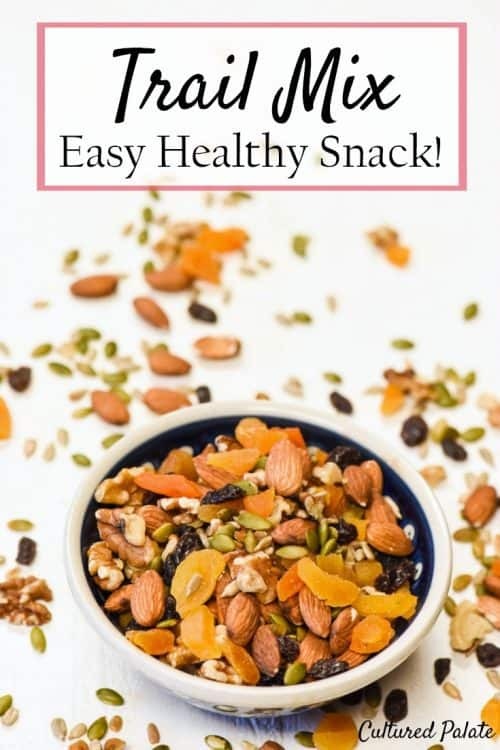 Homemade trail mix is so easy to make, my family loves it.Especially the kind with dried fruit in it for added sweetness! In fact, I have trouble keeping this homemade trail mix on hand. I have finally begun to measure out for each person their allotment to eat. I am sure this sounds overly controlling, but with 9 people eating out of one bowl, well, you can just imagine the chaos! 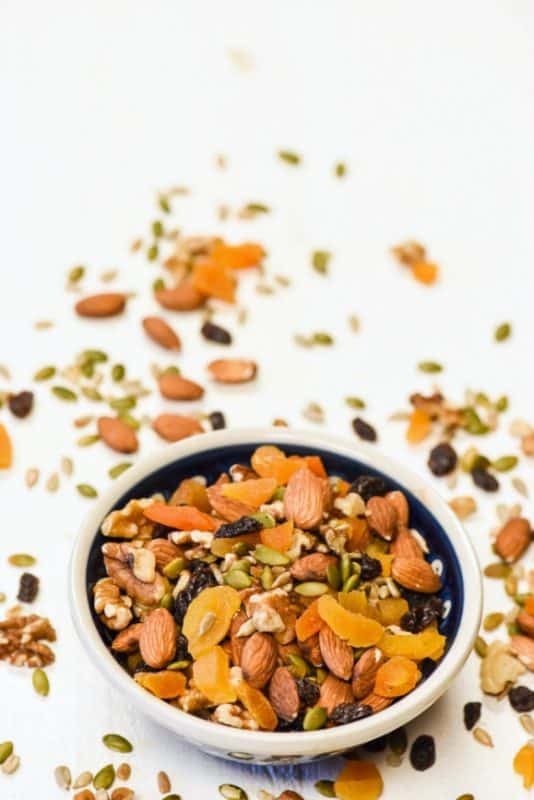 Homemade trail mix makes a wonderful but easy healthy snack full of protein, minerals and fiber. I like to make large quantities at a time, after all, it is no more trouble to do a large batch as a small one and it lasts longer! For an even more nutritious and easily digestible snack for your family, start with soaked and dehydrated nuts. Raw mixed nuts I buy in bulk at a local store work great! Just be sure to store in an airtight container and the homemade trail mix will keep for quite awhile. Ingredients may vary based on your preference. Be creative – the sky is the limit. Since beginning my REAL food journey, I have learned the importance of properly preparing my grains and nuts so as to neutralize the phytic acid. Phytic acid is an anti-nutrient that binds with minerals in the foods we eat and prevents their absorption. Guess what? Phytic acid is in the bran of all grains and in the hulls of all seeds and nuts! You can see why proper grain preparation is so important! If you’ve tried this Homemade Trail Mix Recipe or any other recipe on Cultured Palate please take a minute to rate the recipe and leave a comment letting me know how you liked it. I love hearing from you! You can also FOLLOW ME on PINTEREST, FACEBOOK, INSTAGRAM, YouTube and TWITTER. Energy and yumminess in a small package. 2 c nuts. These can be different combinations like pecans almonds, walnuts, cashews or simply a premixed mix. Any dried fruit such as raisins, apricots, blueberries, cherries, coconut ... can be used. even the raw mixed nuts I buy in bulk at a local store work great! Just be sure to store in an airtight container and the homemade trail mix will keep for quite awhile. We love homemade trail mix. I do the same thing you do and portion it out. It seems to work so much better. 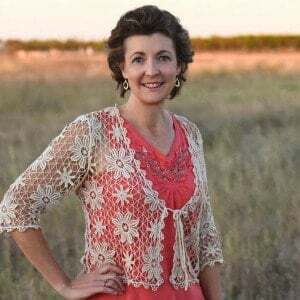 Thanks for sharing at the Nourishing Pin It Party. I love homemade trail mix. I also use a variation of this to make homemade granola, adding in oats, coconut, some honey, and baking it on a cookie sheet until it starts to brown a tiny bit. It’s so easy to make, and much less expensive than buying it ready made that I wonder why everyone doesn’t make it. I’m going to try this. It would be great sprinkled on cereal, or added to homemade muffins or cakes. Thanks. This is a great snack for travelling, so yummy! Emily, you said it – Meals and snacks on the go can be healthy and yummy!